In our last blog, we discussed the issue of a kicking horse and how to fix the problem. Another issue a lot of horse owners might face is a rearing horse. This is another dangerous habit that your horse could develop. To learn how to fix this issue, please read this blog! They have too much excess energy. 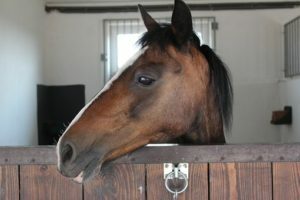 If your horse is physically suffering, they might be rearing to tell you that there is something wrong. Some of the issues could be that the saddle you put on them does not fit correctly, they are sick, their teeth are overgrown, their girths are too tight, or there is something wrong with their vision. To ensure it is nothing that is physically hurting your horse, you will want to do a thorough check of your horse. If you don’t see anything wrong, observe them closer and see if their behaviors change in different environments. For example, if they are rearing during a ride, maybe there is something on the path that is causing them stress, or they don’t want to leave the stable and their buddies. If your horse is confused, this can be the reason they are rearing. Consider your training and how you ride them. Are you asking him to do a trick he hasn’t learned yet? Or a trick that requires he master another move that he hasn’t learned yet? Are you taking him to a new place or through a new obstacle that he isn’t sure of yet? If your horse is exhibiting behavioral problems that you haven’t seen before, you might want to consider what you are doing differently. This also leads into the possibility that your horse is scared. If they are shown a different environment, you are riding differently, or you are letting a different person ride him, this could cause your horse discomfort. Another reason your horse might be rearing is because they have too much energy. Are you feeding them a lot of rich foods but not taking them out to exercise enough? It is important that your horse spends enough time in a pasture or field because they can get the exercise and fresh air they need. If a horse is rearing fairly often more than 12” off the ground, it creates a serious problem for a rider and sometimes for the handler. The greatest danger is that a rider can fall off or need to jump off. Also, many riders will want to pull back on the reins to stop the horse from rearing, which can make them go higher and over backwards. Obviously, the rider would not be in a good spot if that happened. If a horse learns that a rider can be forced off by rearing, they can do it again to get out of work. So, if you notice a horse developing a rearing vice, don’t let it go on too long before bringing a professional trainer in to remedy the problem. For more tips on handling behavioral issues with your horse, please refer to our blog! To learn about our high quality horse insurance plans, please give us a call today at either (320) 243-7250 or (800) 328-9984.